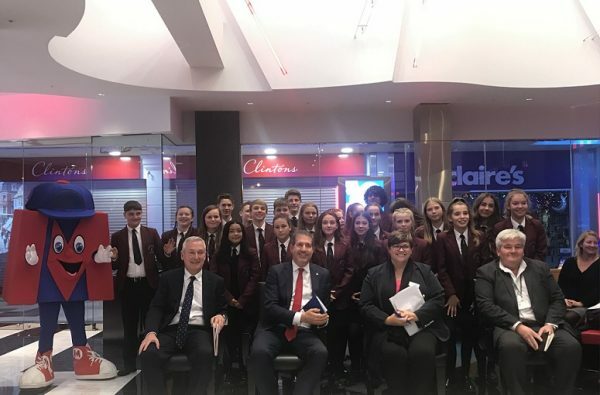 Five teams from a Wendover school studying business have pitched ideas to professionals in Metro Bank’s “Dragons’ Den”-style contest. The Dragons came from a wide portfolio of backgrounds and included a representative from a leading blue-chip organisation which has a representation in Aylesbury, an established private sector enterprise, a charity and a public sector authority. The Dragons present at Metro Bank’s Aylesbury base included Iain Kirkpatrick, Managing Director for Metro Bank UK; Michael Donnachie, Michael Anthony Estate Agents Senior Partner; Caroline Bennett, Director of Fundraising at The Pace Centre; and Nigel Ashton, Director for Commercial Strategy at Aylesbury Vale District Council. As part of their learning syllabus, each team from Year 9 at The John Colet School, Wendover, had a ‘blank sheet of paper’ to incept a new product or service. After a competition at the school, five teams were invited to present in front of a packed crowd of fellow students, parents and friends and many members of Buckinghamshire’s business community. The Dragons would pick one winner. Finally the Dragons selected ‘Team CBE’ for their car battery idea. The Dragons offered their fictional £100,000 investment to the winners.I deas ranged from pencil cases to cakes to heated hoodies for colder days. All the participating John Colet students and the Dragons together after all the pitches were heard at Metro Bank, Aylesbury.